Hearts manager John McGlynn does not want to place too much pressure on striker Callum Paterson. 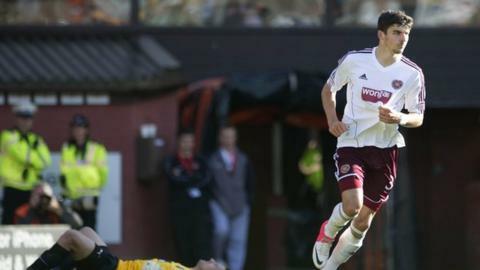 Paterson, 17, scored a brace, his first career goals, as Hearts defeated Dundee United 3-0 at Tannadice. "We don't want Callum or anyone else to get carried away here," the Hearts boss said. "If he had scored two goals last week, he'd have been on the back pages, the next best thing since sliced bread." Paterson has played a number of positions for Hearts this season but it is in the striking role the Tynecastle boss feels he is flourishing. McGlynn continued: "Well, what do you want in a striker? Someone who's going to cause problems for defenders, someone who's going to score goals, someone who defenders actually hate playing against? "That lad ticked all the boxes today." Paterson, who came through the ranks at Tynecastle, has impressed McGlynn greatly. The manager said: "He is a talent, he's got a lot of assets, it's up to us to keep developing that." The young striker has benefitted from cost-cutting at Tynecastle, which has seen a number of strikers that would have been ahead of him in the pecking order leave. "It's not as if we have a lot of strikers at Hearts anyway, we thought there was a good chance to take by putting Callum into that position from what we see everyday at training," added McGlynn. The former Raith Rovers boss warned against over-hyping players, saying: "We've really got to take care of Callum."